Balance Console and Coffee Table. Shown in cherry. Balance Console Table. Shown in cherry. Balance Coffee Table, shown in cherry. With graceful curves and floating tops, the Balance Tables are works of art. Bill and Saer Huston worked together to design the Balance Tables. 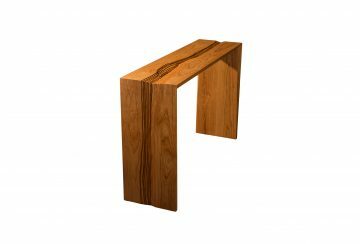 Your shipper just dropped off our new (Rivers) Waterfall Console Table.It is a beautiful table, exceeding our expectations, and it fits perfectly in its new home. We are so happy we selected it. Your company has been a dream to work with. Thanks to you all. Our occasional tables are available in an array of sizes, shapes and designs to suit any lifestyle and décor.